As mentioned in my last post, I am going to completely change the method of armature creation I have previously used for the foil and tape method. I will put a step by step comparison of the two with pros and cons once I have completed this doll and will know for sure what I like about each method and which I prefer. As always I use my figure cheat sheet to make sure I get my proportions right. This is something I have created in word with a doll for each inch ranging for 3″ to 8″. This doll will be 8″, so I am using the largest figure. If you would like a copy of this you are welcome to download it here. In this particular case the legs will not be supporting the piece, therefore they only need to be a single piece of wire. The arm however will be the spot where the doll is secured to the flower. So I have measured a piece of 3/32″ tube from her palm to just above her elbow. 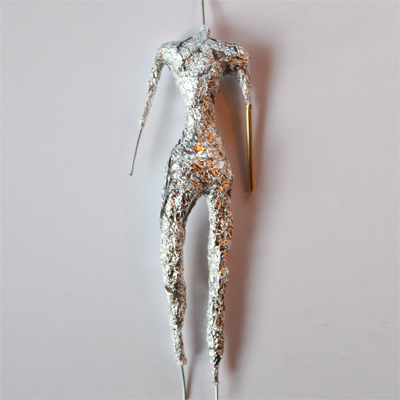 Once you have your required rod pieces in place you can start adding tinfoil to your piece. This will bulk up your piece allowing you to use less clay (which saves you money, but also means the clay wont be as thick which lessens the chance of under-baked clay that can crack in the future). At this point you can start wrapping and posing the doll. I wrapped the torso, then posed the legs and arms before wrapping them. I made sure I covered all the wire with the tape, including right down to the wrist and ankles. 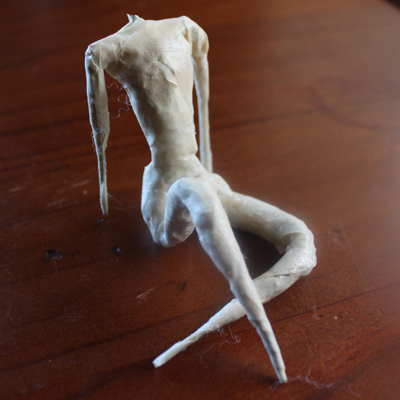 After the doll is all wrapped I have covered the doll in TLS – Translucent Liquid Sculpey. This will give me a better bond between the tape and the fresh clay. 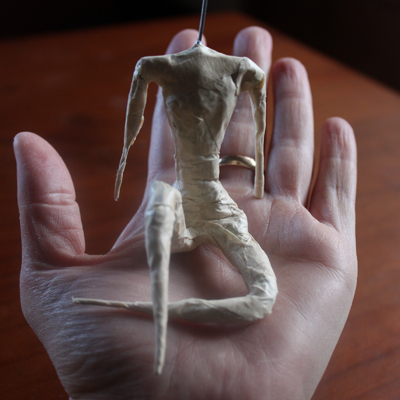 And that’s it, you now have one posed and bulked out armature waiting for you to do your magic on and bring it to life. 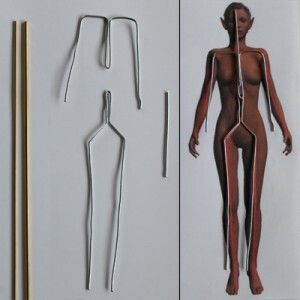 Your armature tutorial is well-planned and I really like your method! Of late, I’ve been toying with the idea of the foil and tape method. My sculpting teacher don’t recommend the foil and tape method because floral tape has wax in it and when it’s heated during the bake, the wax melts. Sometimes it causes cracks and the wax drips out of the sculpture. And that the clay will stick if you are patient and don’t trap air in the clay. I am not turning my back to what I have learned from my teacher, but I’ve seen so many professional artist do this method and SUCCEED. I would start by playing around, using your tutorial and see how it goes. I’ll let you know! Oh, BTW, when are you making her base? I am an avid ooak ethereal/fantasy base creator and always make them for my fae folk and whimsical characters. Thank you for your lovely comments. I have found that the clay makes the tape sticky, but I haven’t see it cause any problems. And as you say – many of the top artists use this method. Everyone has their own methods, and in the end you need to find out what works for you. I find myself changing my methods as I go, I still use the wire and tape, but a lot of my methods have changed so much I should probably post a new tutorial. Hi Cherie. Definitely give it a go! You do amazing work! Thank you for this post. I use the foil method when making my armature cores, too but I don’t always use the tape. Compressing the foil tightly, and then pushing the clay on so that it fills in the tiny, wrinkled texture of the foil core helps get rid of any air pockets. However, when I do use the masking tape, I found that the tape has sufficient texture to allow the clay to grab on and hold. I haven’t experienced any issues with the clay making the tape sticky, but I use polymer clay, so that may be why. When I make hand armatures, I use cloth covered floral wire, where the cloth covering has the texture needed to allow the clay to stick, but I like the idea here of using TLS to coat the bare wire, for when I can’t get a hold of the cloth covered kind.